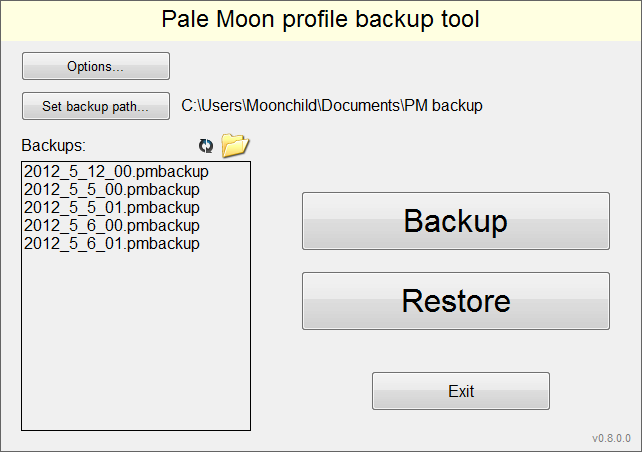 This tool will help you back up Pale Moon profiles. It is a simple tool and doesn't have much in terms of advanced features, but should give you a quick and easy way to create backups of your Pale Moon data and customizations. It was put together mainly for people who have standard installations and/or who do not have enough knowledge of the Windows O.S. and filesystem to manually backup the profiles. It is not meant to be very versatile or flexible, but "gets the job done" in most cases. The current version has basic options for compression, but does not offer encryption or password protection of any sort, so you will have to make sure yourself to keep your backups in a secure location. Note: Please close Pale Moon before attempting to backup/restore your profiles. Not doing so may cause an incomplete backup, corrupt data or give errors.